Sew up a perfect playdate outfit with this fabulous pattern! Your little sweetie will love bouncing about in one of these easy-to-wear outfits. 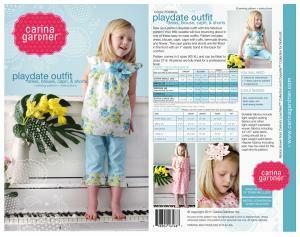 Pattern includes dress, blouse, capri, capri with cuffs, bermuda shorts, and flower accessory. The capri pants and shorts are flat-fitted in the front with an 1” elastic band in the back for comfort.